During his corporate career, photographer Peter Lee, of Orange in central-west New South Wales used the latest electronic equipment to analyse high-level financial data. 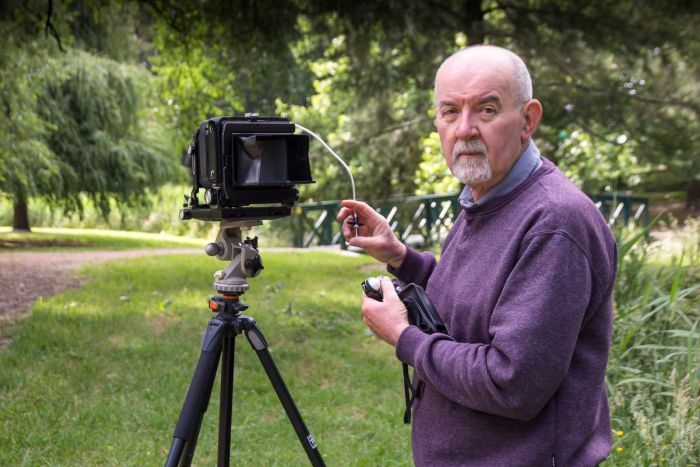 These days the tools he uses for his large format analogue photography are a far cry from that and in fact, there is not a piece of digital equipment in sight. All he uses is a pencil, a simple mechanical light meter, a cardboard frame to help compose a shot and an angular black camera with adjustable bellows that looks a bit like an accordion. It is a slow, solitary art, but one he has found to be life-sustaining. You’ve got to force yourself and be mechanical; you don’t just hold it up to your eye and take a photograph. Mr Lee said he rebelled against digital photography because it could not capture the range of light and shade he was looking for in his images of nature, old buildings, and country vistas. “With analogue photography it may not be as pin sharp, but it has that beautiful range of tones you can’t capture on digital,” he said. 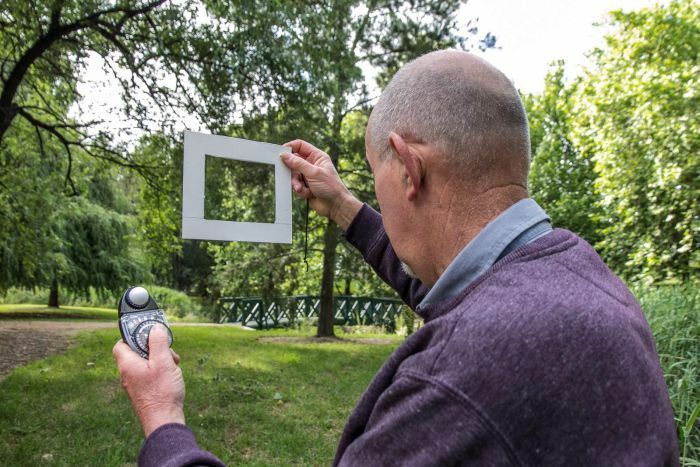 He uses large format negatives that are 10 by 12 centimetres in size — and sometimes even larger — which allow him to capture big images without losing quality. 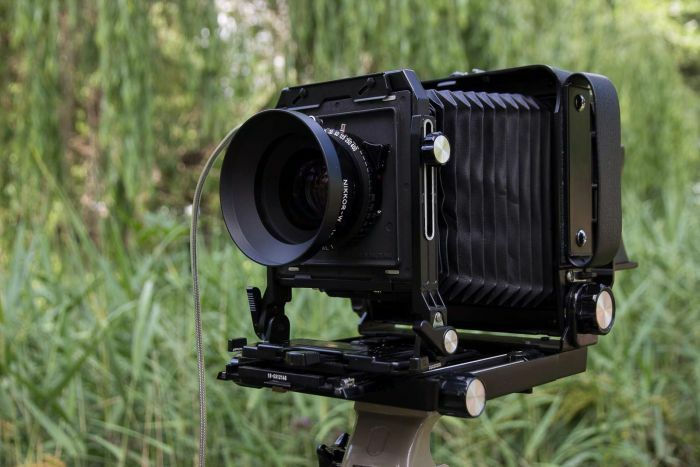 Large format analogue photography can be an expensive practice because the negatives cost around $70 for a pack of 25. “You take your time; you don’t shoot off a lot,” Mr Lee said. He buys his cameras overseas, mostly from the United States, where he is currently getting another one built. Mr Lee explained that analogue photography required him to blend the creative and methodical parts of his brain. He said when he first arrived on scene he thought of how it was going to look in black and white. Then the mechanical processes take over as he undertakes up to a dozen tasks before taking a shot, including composing the scene with his cardboard frame and measuring the light with his hand-held meter. While Mr Lee’s former career saw him analysing data in high finance, now he finds himself scribbling a lot with a pencil in a small notebook. “Unlike digital where you get all the data like f-stop or light, you’ve got none of that with analogue. Mr Lee prefers to work alone because it helps him think clearly. “When you’re working with film photography it’s a very, very slow process and you don’t want other people around you,” he said. Mr Lee does delve into the digital world, particularly to connect on Facebook with other Australian large-format analogue photographers, whom he said seem to be concentrated around Melbourne. Mr Lee is now 65 but he fell in love with film photography about 50 years ago when he was a teenaged member of a camera club at Leura in the NSW Blue Mountains. “Those old fellows taught me a lot,” he said. For two years in the 1970s he spent every weekend travelling to the historic central west gold rush town of Hill End to capture the tonalities of its heritage streets, buildings, and natural beauty. However, then followed decades where the cameras got put on the shelf and eventually sold. “As I continued to work and climb up the corporate ladder, I found I had other influences coming down on me and photography got forgotten,” he said. Now, after Mr Lee has survived cancer and is semi-retired he said he wanted to get some creativity back in his life and has rediscovered his photographic passion. He still does some part-time work, but said now it was simply to earn money to fund his photography. One of the analogue cameras used by photographer, Peter Lee.